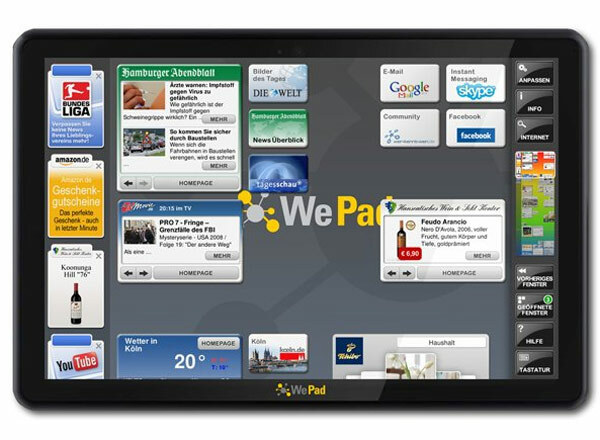 Another day, another tablet announced, although this latest one looks quite interesting, the Neofonie WePad. The Neofonie WePad is made by a German company and it will feature an 11.6 inch touchscreen display with a resolution of 1366 x 768 pixels. Processing is provided by an Intel Atom N450 processor and it also features Intel GMA 3150 graphics, and 16GB of storage as standard plus the option to upgrade to a 32GB model. There is also a 1.3 megapixel web camewra, two USB 2.0 ports, a built in multi format card reader, a SIM card slot and a Lithium-ION Polymer battery which is good for about six hours. The Neofonie WePad will run Google Android, and will come with a range of applications built in and integration with the Android Marketplace. There are n0 details as yet on pricing or availability, you can find out more details about the Neofonie WePad over at the Product Page. Have a look and our article on Android vs iPhone to see which smartphone and mobile platform is best for you.